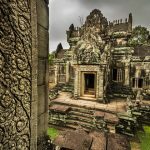 Known as the “Kingdom of Wonder” and its heart - Angkor Wat, Cambodia concentrates the largest religious structure with an amazing array of ornate carvings and warm welcome people. 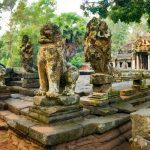 The 14-day Cambodia tour will start by exploring the bustling Phnom Penh, the capital of Cambodia, and also figure out about the horrible history of the Khmer Rouge regime. 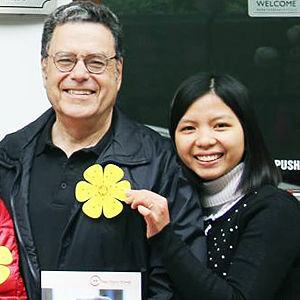 Feel the kindness and hospitality on the faces of Bayon residents when they smile with you. 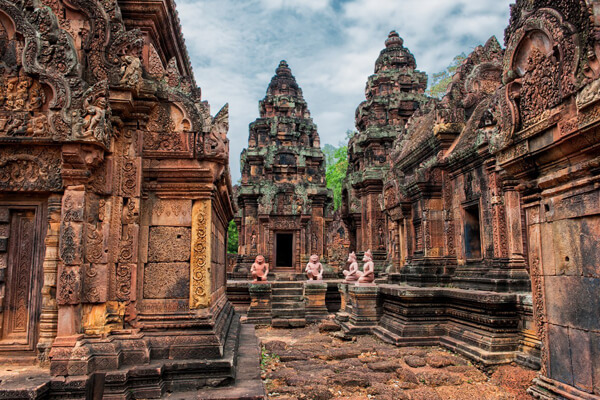 A surreal and mysterious Cambodia is waiting for your exploration. Upon arriving in Phnom Penh, you will be welcomed by our friendly local guide, then you will be transported to your hotel. After completing the check-in procedure, it’s time for you to relax and explore surroundings on your own. 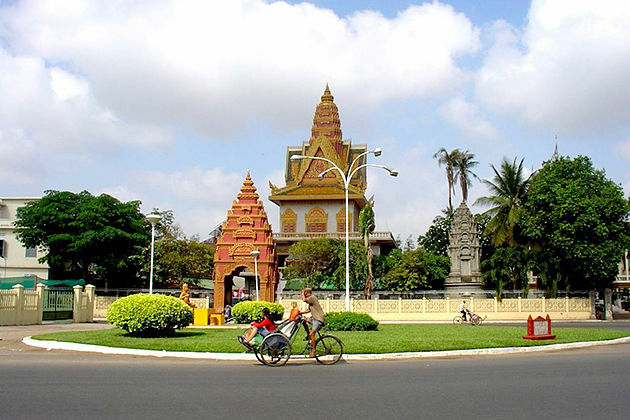 Phnom Penh, which is the capital of Cambodia, is also considered as the “Pearl in Asia”. 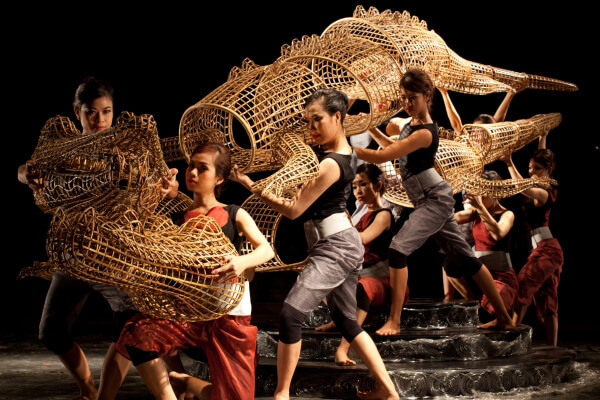 Until now, Phnom Penh still retains its charm of French colonial influences. You can spend a day to see the lovely old French architecture along the grand boulevards. 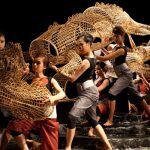 In the 7:00 pm evening, you will have a chance to watch the Cambodian Living Art Performance which illustrates the beauties of Cambodia life and culture at the Cambodia National Museum. You can enjoy the welcome dinner before or after the art performance. After having breakfast at your hotel, your tour guide will take you to visit Beoung Cheoung Ek Memorial Museum (Killing Fields), where Khmer Rouge regime executed and buried more than one million victims from 1975 to 1979. 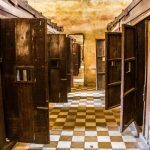 This destination will tell you dark stories of Cambodia history. 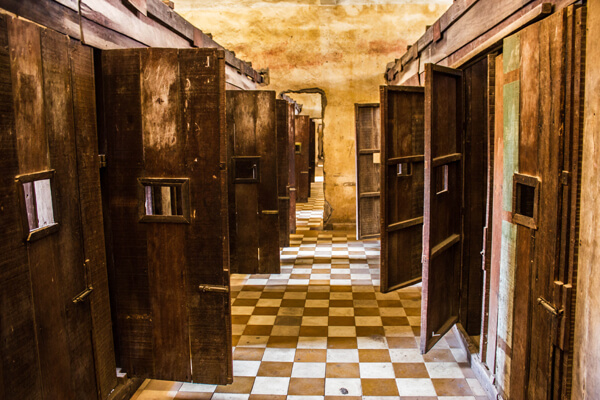 Then, you will go back to Tuol Sleng Museum in Phnom Penh. After having your own lunch, you will move to the National Museum, the Royal Palace with the Silver Pagoda. 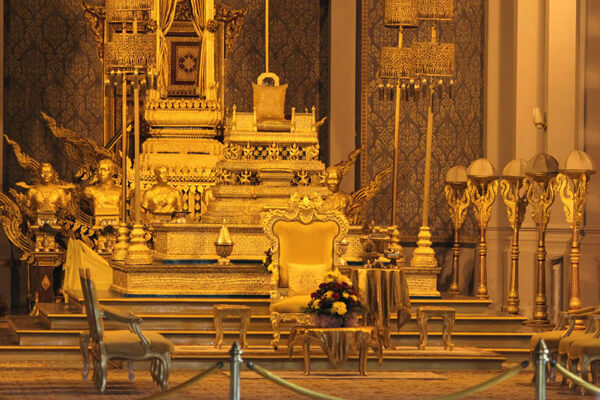 The Royal Palace is the most outstanding palace in Cambodia with the classic Khmer roofs and ornate gilding. Its architecture shares the common with its neighbor is Thailand. 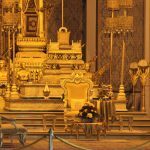 Because the King Sihamoni is living in the palace, visitors are only allowed to visit the Throne Hall, the Royal Treasury Hall, Napoleon II villa and Silver Pagoda. Evening when the weather is no longer extremely hot will be the proper time for cyclo trip along the Mekong riverfront and go by Wat Phnom. Have your breakfast at the hotel and ready for check-out. You will continue your journey to Kampong Cham. On the way, you will have an opportunity to cross the famous bridge representative for the Cambodia and Japan Friendship constructed in 11966 called Chroy Chongvar. You will be greatly regret if you do not stop at Skoun, which is a small village sell amazing local cuisine like deeply fried spick, cricket, birds that they sell as the snacks. These dishes challenge the courage of the bravest visitors. If you dare to experience, it will be an unforgettable memory. Phnom Pros and Phnom Srei will be the next two famous destinations that you will visit when being in Kampong Cham. When leaving Kampong Cham, your car will drive through the beautiful pepper farm, cashew nut stretch to the skyline. 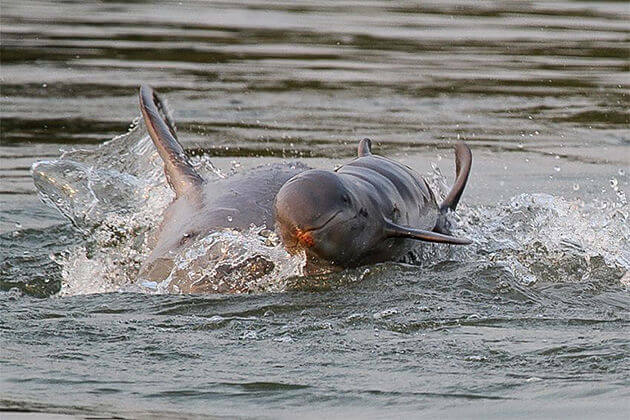 The last attraction before checking in your hotel is the amazing Irrawaddy Mekong Dolphins. 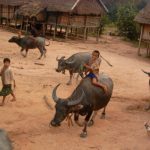 After the breakfast at Rajabori, you will be transferred to Ratanakiri (Banlung), you can see the lovely rubber plantation, peppercorn farms and the hilly villages on the 4 hours journey. 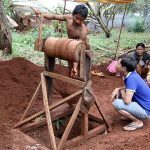 Ratnagiri, which located in the Northeast, is a hilly city famous for magnificent natural views and abundant natural resources. 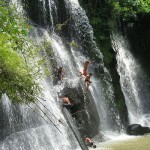 This place is totally suitable for those, who are looking for original experiences with nature. 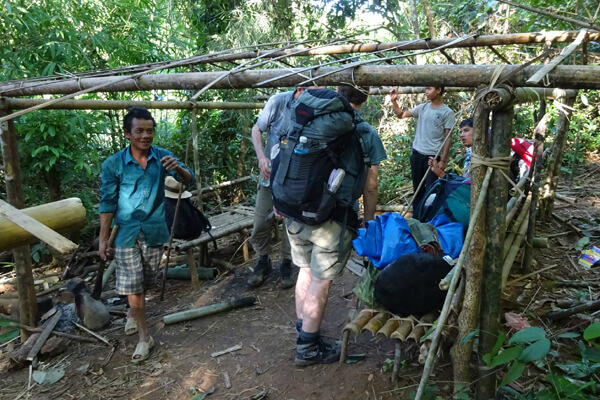 The advantages in natural characteristics have made Ratanakiri become a place for plenty of adrenaline activities. 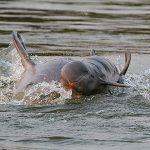 As risky travelers, you will definitely satisfied when swimming in the crystal clear volcanic lakes, showering under waterfalls, or trekking in the Virachey National Park. 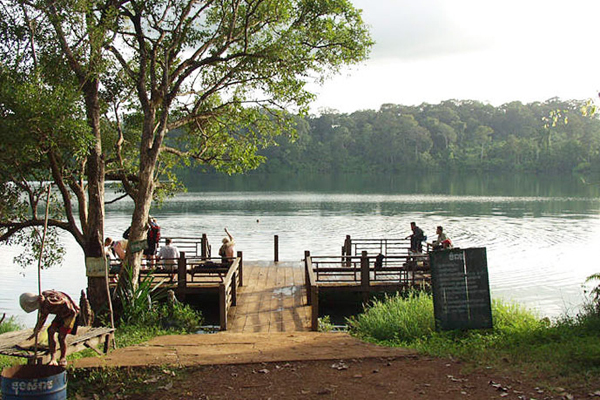 After having wonderful moments in Ratanakiri, you will arrive the hotel for check-in and ready for swimming at the Yeak Loam volcanic lake. Let’s enjoy your breakfast because this day will need a lot of energy for trekking activities. Begin the trip, you will be transferred to Banlung about 35 km to the North. 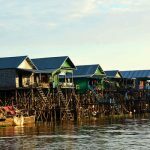 Next, you will arrive at the jetty in the northern part of Vearn Sai district brings you far away from the chaotic of Cambodia streets. After that, we would like to transfer you to a peaceful countryside where you can find for yourself refresh and tasty cup of sugar cane from local markets. 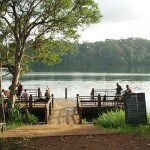 Then, you will continue your trip by boarding the local ferry heading to Koh Perk village. Sit back and enjoy your course along beautiful Sa Sen River. Local children will inform when your trip comes to end. 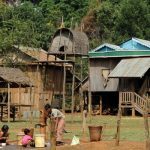 Before reaching Koh Perk, you will pass by Kachok tribe, a place with swathes off paddy fields, banana groves, and pepper plantations. 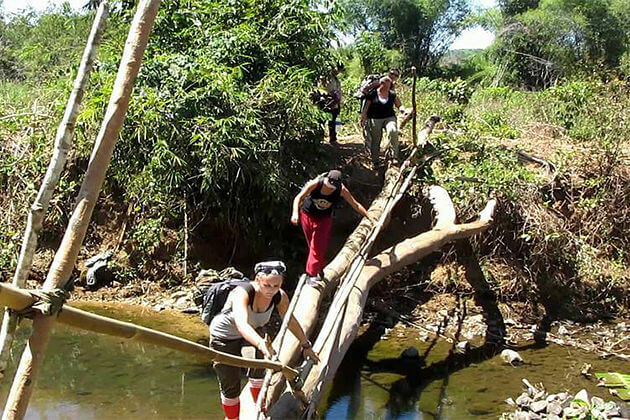 On the first day of trekking adventure, you would definitely be astonished by the extraordinary landscapes a perfect matching of rice fields, pop-up villages, and labyrinthine bamboo forests. 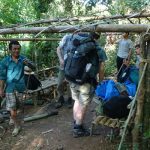 Our professional trek leaders will not let you alone among these things, they are happy to guide you with their profound knowledge about this place – Also is their home! After a long way of walking, you must be exhausted and ready for lunch. Sometimes, you may hear the welcome roar of the wild animal together with the sound from streams. 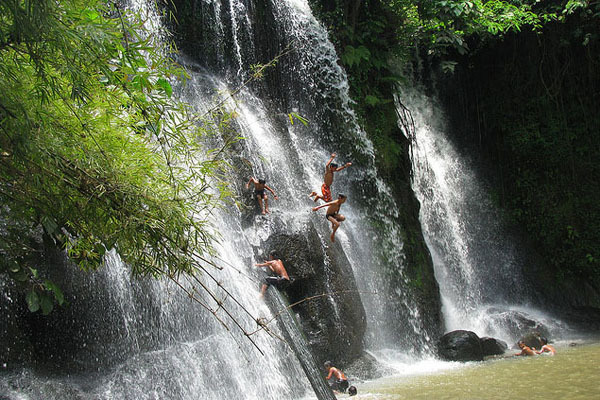 The reward for long hard trekking is a clear and refresh waterfall waiting for you. Have you ever prepared your dinner by yourself? You will have a memorable experience by going fishing in the traditional style. 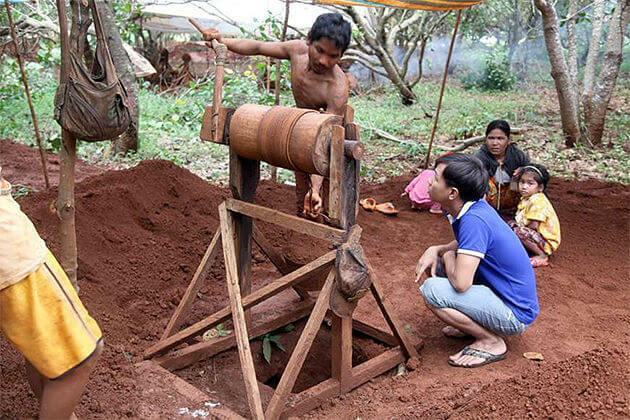 All your fish will be cooked inside a bamboo tree, which brings to you a new flavor. At the end of the day, your tent will place right next to the waterfall where you will easily fall into sleep by the soft lullaby songs of the waterfall. As the sunlight pours into camp in the early morning, make sure you take advantage of your environment one last time and go for a dip in the waterfall to start the day off. Surely there can be no better way to invigorate and inspire for the day ahead?! Breakfast is served and you won’t find a fresher alternative – fish caught from the waterfall itself are cooked to perfection on the campfire, along with tasty noodles and a quick coffee, if the water wasn’t enough to wake you up. Make sure you eat up though, today’s 20km trek requires all the energy you here. Experiencing the jungle at this time in the morning is a real pleasure as the light plays down from the occasionally indiscreet canopy of trees above. Shafts of gleaming sunlight set the jungle alight and guide you on your way through this unblemished setting which is, in every sense, an ‘ off the beaten track’ experience. 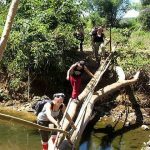 Climb mountains of rock to hitherto unreached heights to indulge yourself with the stunning panoramas available and push on through the multitudes of the stream and river crossings necessary to reach lunch; your first stop of the day. Picnic over and appetite sated, for now, pick up your trek and eventually find yourself with a new natural vista to engorge your visual appetite. The stone field rises out of the jungle like a shambolic Stone Hinge – there’s no order but what the Tropics have deposited here is tablet upon the tablet of white stone that tic-tac their way around a 50m square distance. Truly a sight to behold, the locals frequent the area, with a tributary running picturesquely around it, as a popular fishing haunt, but tonight it could be your bedroom. 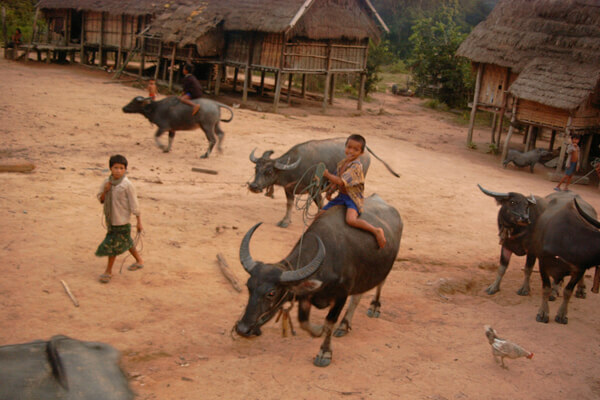 When visiting the village, take your time to see how a normal day in this ancient tribe runs. Before taking photographs of local people, make sure that you asked for permission. Lunch for today is a little bit more special with sticky rice and local product which give the meal a distinctly regional flavor. If you desire to experience adventurous felling try some chili and garlic dipping sauce. After fully enjoy the meal, a quick walk back to the boat and get back to a more recognizable civilization. Today, you’ll spend almost a day on the road head to Preah Vihear province via visiting Thala Borivath. 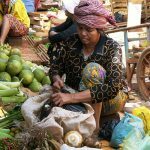 You will have a chance to experience early shopping at the Banlung market or to see the ethnic people sell their products before moving on the route to Preah Vihear province via Stung Streng. 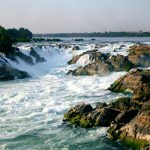 After that, you will drive back to the jungle and visit the amazing waterfall of Mekong River called Sopheakmit. On the way, the tour will stop for the tourist can rest for a while before moving to Sro Em to check in at the hotel. 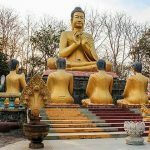 Start your day with yummy breakfast at a beautiful local restaurant, and then you will be transferred to the foot of Preah Vihear Mountain before reaching the mountaintop by truck to pay a visit to the temple of Preah Vihear. 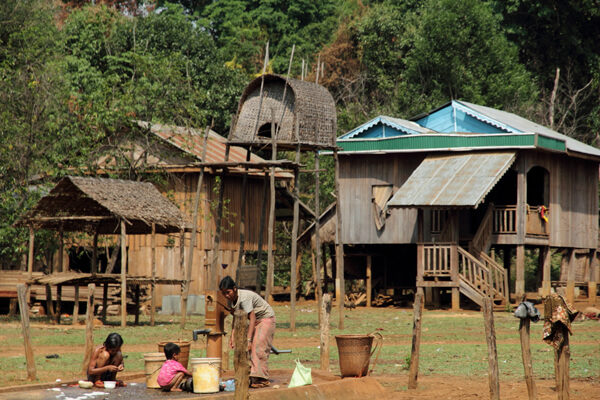 Continue your trip will be a scenic route to Siem Reap province. 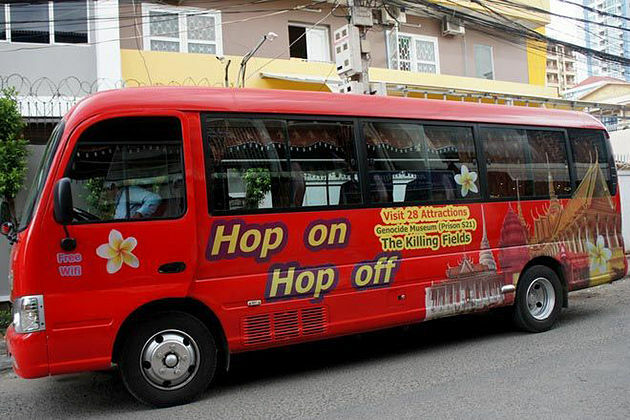 The bus will stop at two ancient temples is Koh Ker temple and Beng Mealea temple. Next, we will reach the hotel to check in and have dinner later. 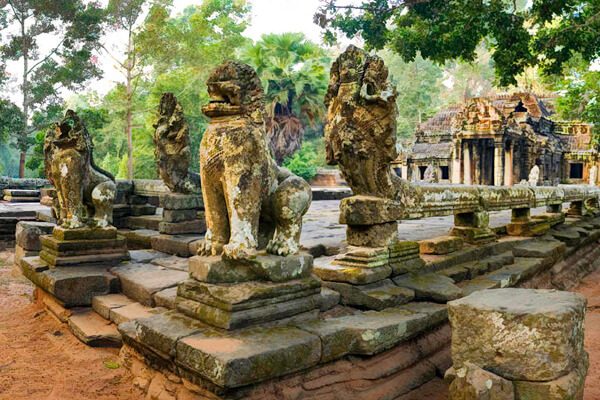 Wake up early after enjoy your breakfast to explore the Angkor Thom the pride of Cambodian. 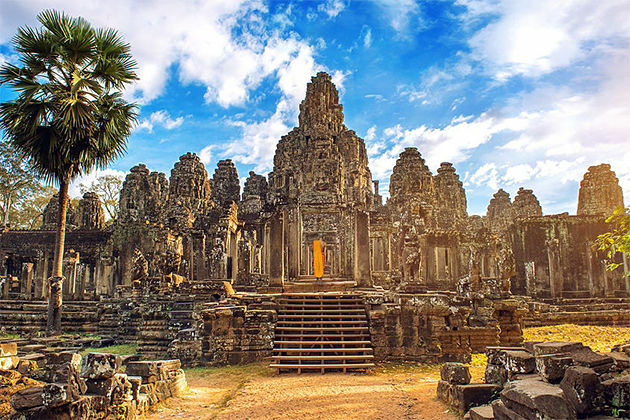 The main temple in the Angkor complex is Bayon. 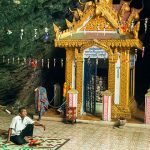 There are some small temples nearby; you will visit Baphuong, the Terrace of the Elephants and the Terrace of Leper King. 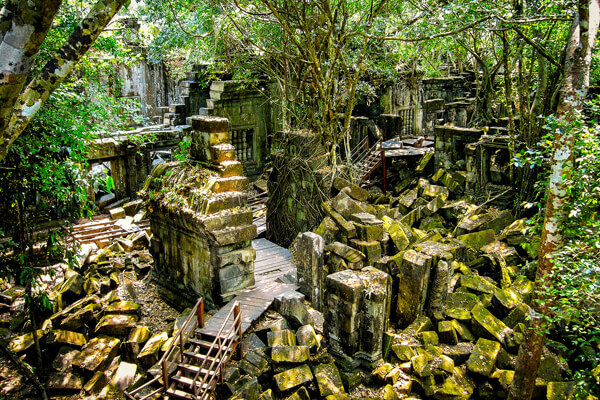 You can miss out the jungle near the temple covered by balsa wood trees and vines. After the temple tour is the time for lunch near Siem Reap River and takes a short nap in the hammock as Khmer people always do. 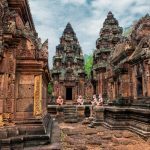 The afternoon tours will start by the trip to Banteay Srei temple also called “Women’s Temple”, and is known for training the female soldiers to fight back the enemy. The temple is constructed with very girly beautiful pink sandstone and stone carvings. 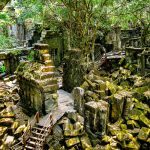 If the time permits, you can explore the ruin of Preah Khan sitting in the middle of the jungle; on the way to it you can listen the sound of the bird giving you a pleasant time. Tonight enjoys having a dinner with the Apsara performance identify the unique Khmer culture. After breakfast, you’ll travel to the Phnom Kulen Mountain to discover the thousand-year-old carvings; thundering waterfalls and iconic reclining Buddha that make Phnom Kulen National Park become one of the most popular destinations of Cambodia. Enjoy your lunch at a local restaurant before continuing your trip to Banteay Kdei temple. At the end of the day, get back to the town and stop at Pre Rup temple to observe the astonishing sunset. Start your day with a nourishing breakfast at the hotel then moving in tune with the rhythm of annual flood in Tonle Sap. 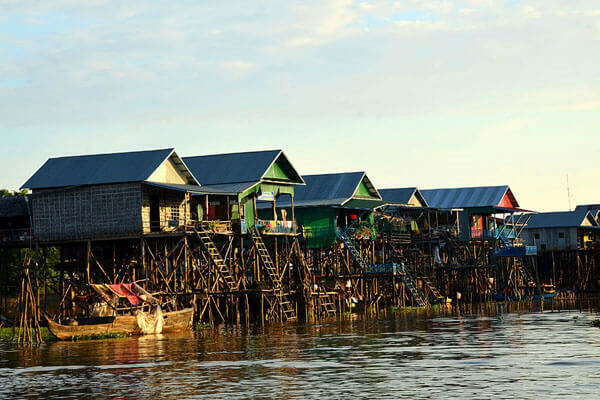 You take a boat to visit the village of Kompong Phhluk on stilts. The great ecosystem will show up on the way of canoeing by hearing the calls of macaque monkeys and the forest under the lake’s surface. You’ll see a Buddhist temple standing on the island with some beautiful Buddhist painting on the ceiling. Have lunch then depart to Battambang the city of rice in Cambodia. 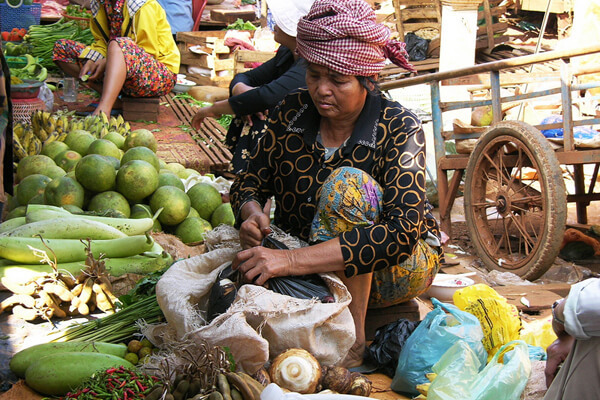 Enjoy your breakfast at your hotel, then begins your excursion to Battambang know as the City of Rice Bowl in Cambodia. 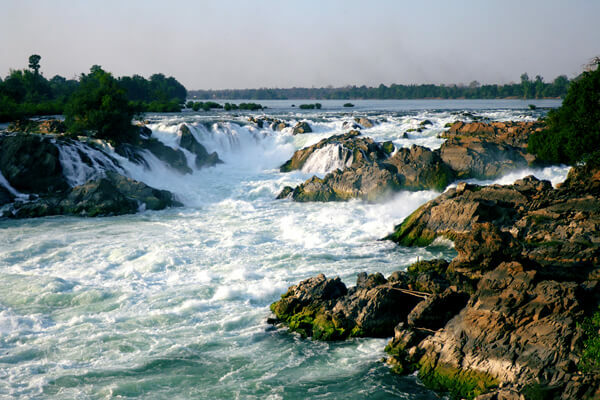 It is situated along Sagkae River and scattered with the old colonial architecture traits. The uniqueness of Battambang is the good blend between the old and modern city. 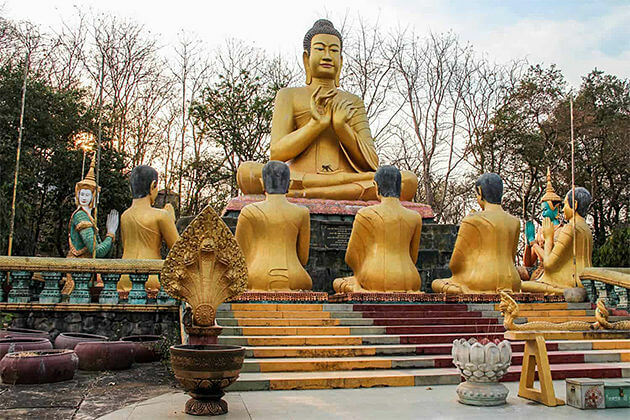 Come to Battambang, you’ll pay a visit to two famous temples are Phnom Banon and Phnom Sampeau. 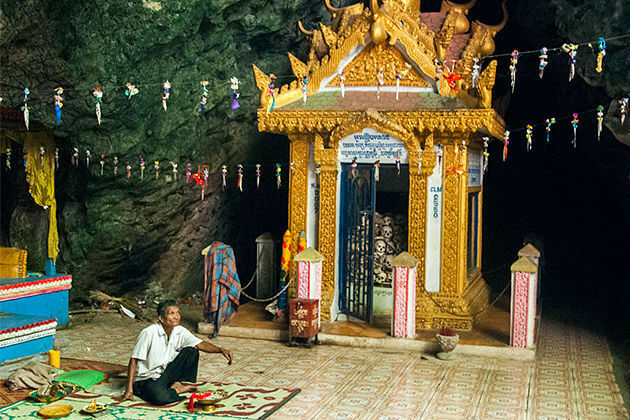 Phnom Banon was originally a Hindu temple while Phnom Sampeau is now a Buddhist temple. After breakfast at the hotel, the last day of your trip will start by visiting the old lovely village in Battambang called Phum Wat Ko, which concentrate a lot local pagodas and ancient houses. Say goodbye to Battambang you will depart to Siem Reap then stop at Preah Netr Preah District to see Cambodian families make stone and wood carvings. After that, you will drop off at Siem Reap International airport to ready for departure flight.